The symbolism in the Circle of Peace works on the relationship level: “The I – finding the ‘stillness' inside oneself” and “the Thou – the path that leads from this stillness back towards life”. The Circle of Peace is a symbol of identification to overcome the alienation and for the spiritual liberation of man in our modern times, which are hostile towards the soul. A world in which we are subject to a materialistic and technocratic ideology (the stones in the Circle of Peace serve as projection surfaces for the images of the mind). As such, the symbolism in the Circle of Peace is about a new spiritual awakening and it "speaks" about a person who has found the path back inwards to his own soul. Thus strengthened from the inside, he can give himself outwards. 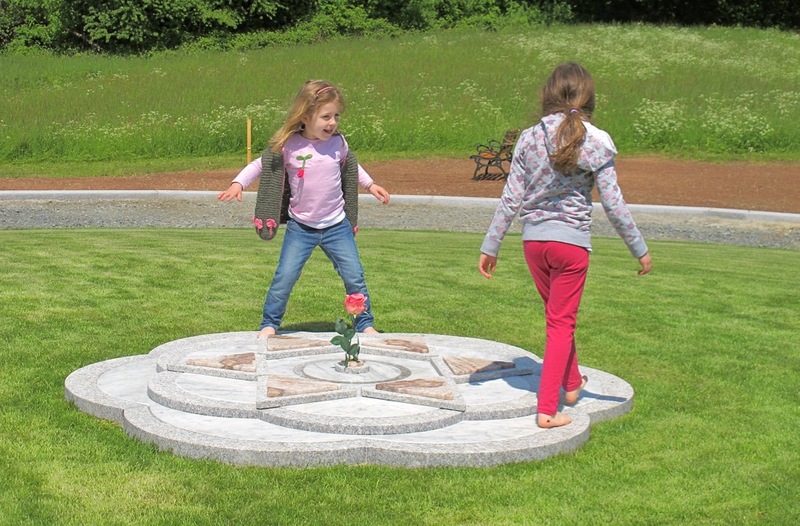 The symbolism of the Circle of Peace encourages visitors to once again become aware of the most valuable potential inside human beings; namely the potential that makes humans human in the first place: the spiritual dimension. Only through this dimension can the whole beauty and depth of life open up to us in our short lifetime - in love. Most people die without ever having lived. When will we realize that life is about learning love? “How could this project help the world?” – a question asked by many who consider themselves knowledgeable and realists. Yet, how realistic are the conceptions of a person who doesn’t acknowledge the power of ideas? Aren’t those ideas that initially seem insignificant and unfounded, the ones that often end up changing the world? So, how could this Circle of Peace help the world? As an individual, one must be able to give his yearning an expression and a material form, so that this yearning doesn't die. Societies too must express their own desires and fears to gain orientation and clarity. The Circle of Peace is an expression of humans’ yearning for freedom and peace. This is why the commemorative stones in the Circle of Peace are empty. They are open and free to receive the projection is inside people, since: the actual renewal and peace agreement can only be realized inside oneself. As a sign of peace for our country the burden of the German past can be projected onto the stones: persecution, war, Shoah. Each stone, however, represents the transformation of a burden into a blessing for the future, which here is “German responsibility”; as it applies to every other nation in the world. The Circle of Peace is the materialization of an idea that represents life. The entire monument site has been constructed with the Turning Point at the center of the Circle of Peace as the measurement point. It bears the Hebrew inscription: “life”. This idea of life is a necessary contribution to German culture. It should be honored and recognized as such – in silence. The Circle of Peace represents reconciliation – in truth, justice, and forgiveness, which can take place in the Tree of Life (within the circle). Here, some people will realize: we do not create reconciliation, because we do not bring about truth, nor justice, nor forgiveness. In this sense, the symbolism of the garden points towards the essence, which people strive to find by believing in a profound truth or higher power: peace and justice that originates from the heart and naturally seeks to establish itself in the outside world. Expressed in a Christian manner: The peace that humanity yearns for grows out of reconciliation. This makes peace with and from God possible. The German word for reconciliation, “Versöhnung”, can also be interpreted as “Ver-Sohnung”, which means to become a Son. It is the peace that can be found on the path (with God) to oneself and the peace that the individual can give - in the Son - to the world.